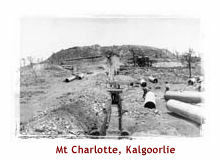 The Goldfields Water Scheme was completed in 1903. In a remarkable feat of engineering a pipeline more than 600 kilometres long connected the Western Australian goldfields, and the communities along it, with a safe and reliable supply of water. 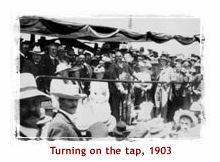 The residents of the goldfields had agitated for the provision of a range of services, particularly fresh water, from the Western Australian Government since the mid-1890s. It was one of the issues which fostered antagonism between t'othersiders and sandgropers. John Forrest was reluctant to spend money on public works in the Western Australian goldfields, as its reserves of gold could have easily petered out as they had elsewhere. Government spending on infrastructure such as the Fremantle Harbour and the extension of the Western Australian railway network, was eventually assigned to the Goldfields Water Scheme when it was clear that the alluvial gold which began the gold rush was accompanied by large underground deposits which could sustain a long-term industry.